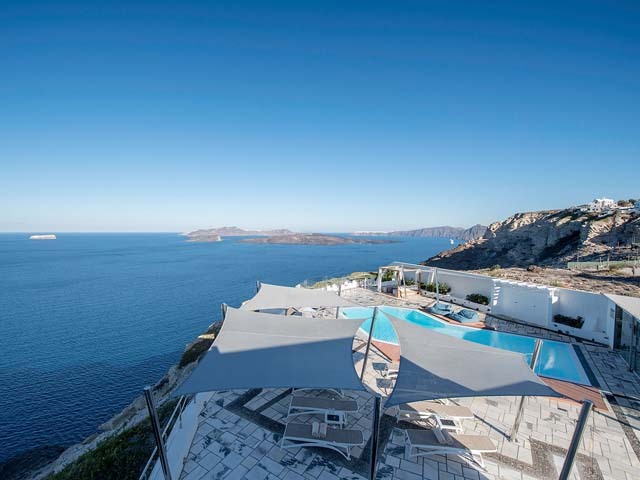 The beautiful village of Megalochori makes a welcome and peaceful alternative to the busy tourist attractions of Fira and Oia and the jostling of the summer crowds. Protected from the strong Cycladic winds, the traffic free winding lanes lead directly to the village square with its pretty churches and picturesque Venetian bell towers. The Stone House can only be described as a ‘small treasure’. 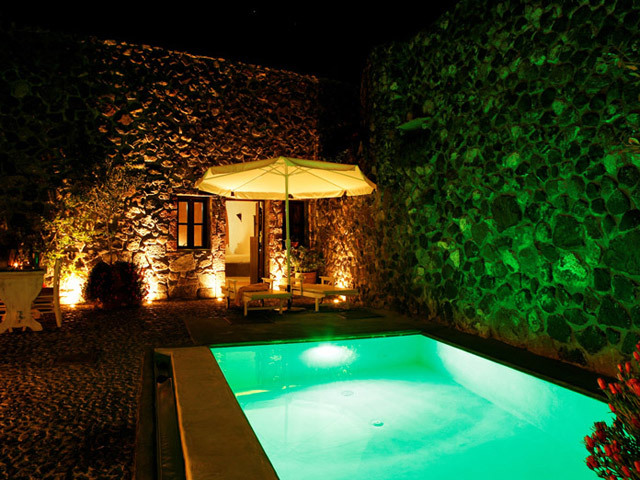 Tucked away in the heart of the village, it is a gentle 150 meter stroll up a foot path from the village square, to the charming villa. 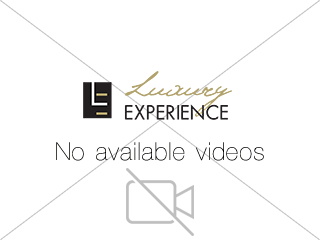 The name is derived from the exterior of the house which is clad in local volcanic stone. 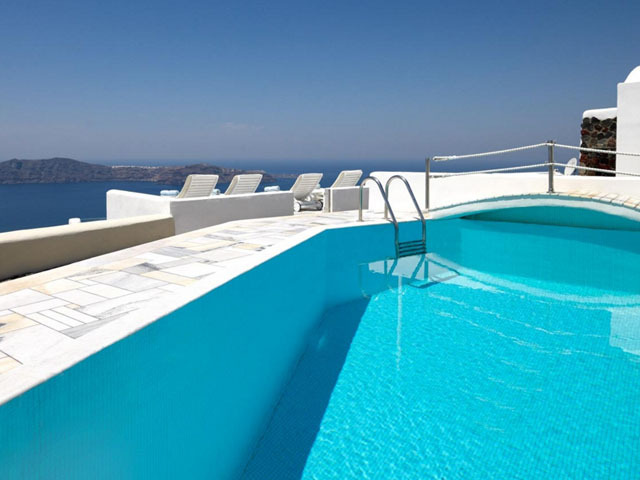 This newly renovated villa, originally a ‘canava’, was once used to produce the sweet nectar-like dessert wine, ‘Vinsanto’, which is unique to the island of Santorini. 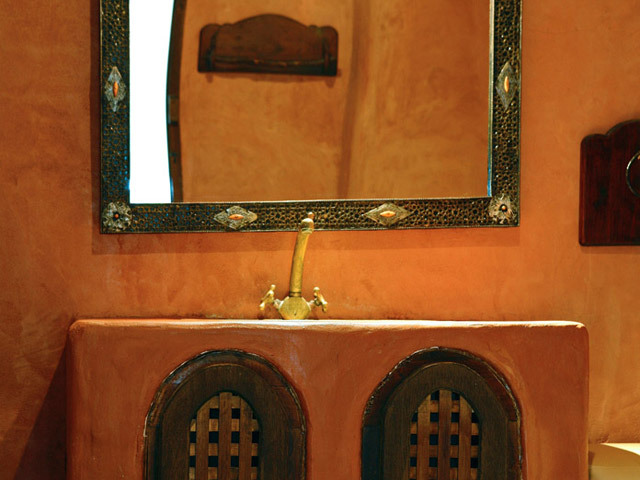 Two cylindrical troughs, once used for distilling the wine have been preserved to make unusual interior light features. 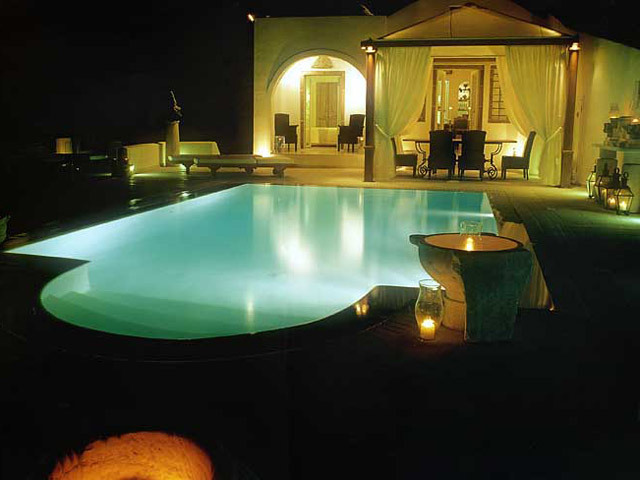 The enclosed cobbled courtyard has a private plunge pool which doubles as a Jacuzzi with four massage jets to one side of the pool. 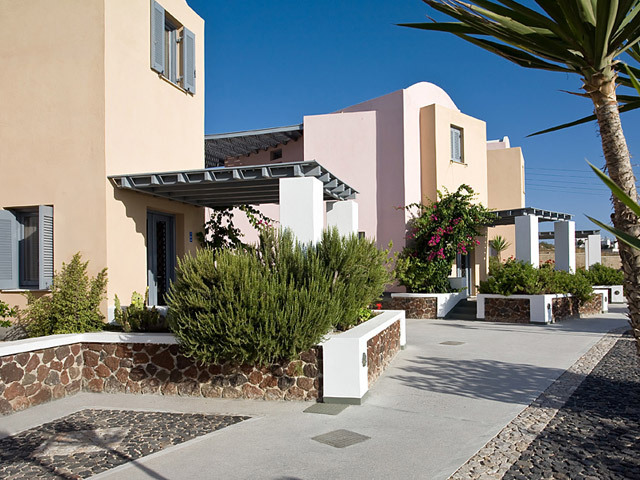 The Stone House is perfect for a couple that are looking for a small, traditional and uniquely Santorinian home on the island. 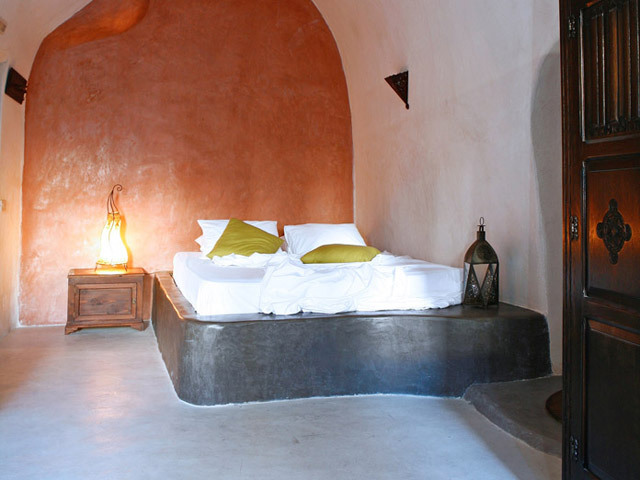 The Stone House Villa is situated in the traditional settlement of Megalochori. The villa is reached on foot along a footpath. A 150 meter walk from the central square of the village. 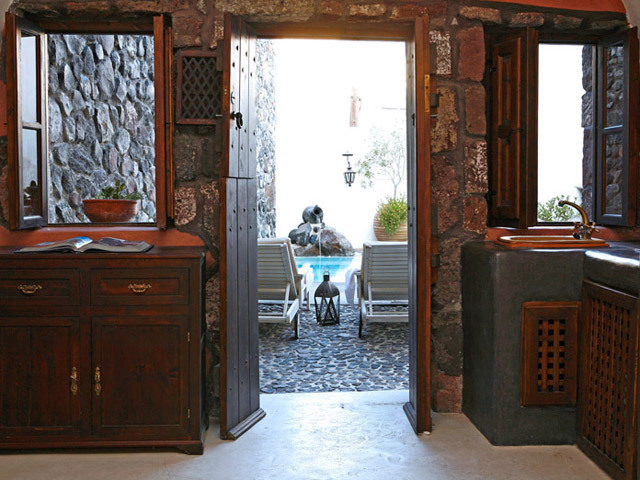 *View: Enclosed courtyard with private pool and potted olive trees. 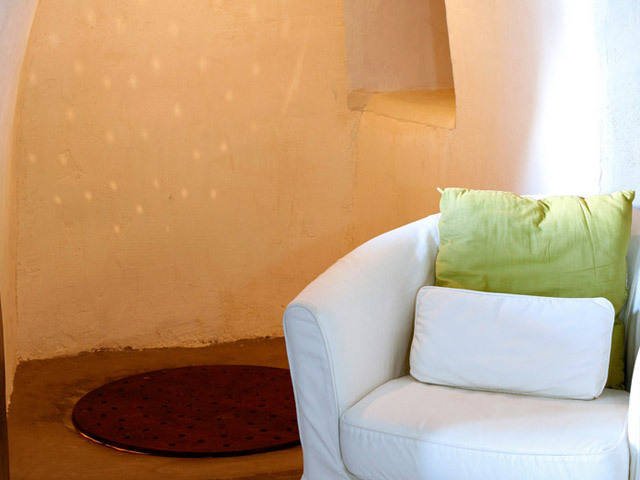 The ‘canava’ has one open-plan room which serves as a sitting room and bedroom, with a small kitchenette to the front of the villa. 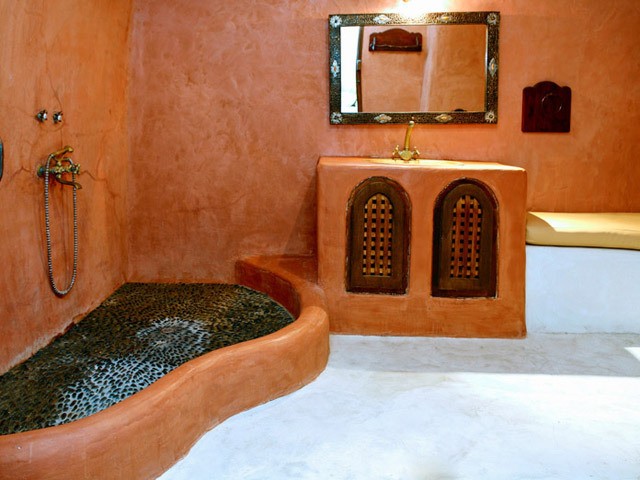 The spacious Moroccan style bathroom boasts with hand-crafted brass fittings and has a stone banquette and large shower. 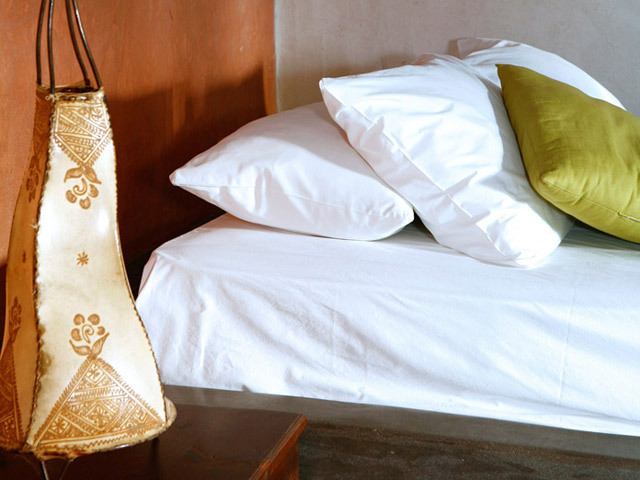 Bed linen, towels, pool towels, bathrobes, slippers and guest amenities provided. Private tour guide & Boat charters on request.